CEO of The Citizen By Investment Unit Les Khan (left) with Imran Farooq, CEO of the Dubai-based Samana Group. 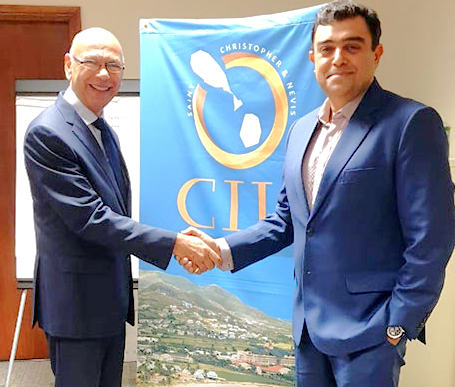 BASSETERRE, St. Kitts — Allegations that foreign advertisers offer low-priced offers to access the Citizenship by Investment Programme (CIP) are misrepresentations, according to St. Kitts and Nevis and CBI officials, who indicate the Government takes very seriously. Such activities have never been permitted or been endorsed. CEO of the CIB Investment Unit Les Khan, recently reinforced this position while speaking at the International Real Estate and Investment Show in Abu Dhabi and the 12th Global Residence and Citizenship Conference, hosted by Henley and Partners in Dubai. During the same meetings, Khan discussed the allegations during a series of one-on-one meetings with agents across those territories to confirm they are maintaining the Federation’s long-standing policies, which are unchanged. • US $250,000 for the Sugar Industry Diversification Foundation (SIDF). Two entities were recently identified as being in breach of Programme guidelines. The Citizenship by Investment Unit (CIU) has listed them as entities not authorised to submit an application for Citizenship by Investment on their behalf or on behalf of any other person on the official website. Khan explained an applicant does not qualify for citizenship unless they have made the appropriate investment. A person wishing to apply via the real estate option must provide the corresponding purchase and sale agreement, which must be in keeping with Regulations thresholds. Any person found to have fraudulently claimed to have submitted the full payment will not be approved for citizenship. The Government of St. Kitts and Nevis reiterates its commitment to uphold the integrity and legitimacy of St. Kitts and Nevis’ Citizenship by Investment Programme and takes disciplinary action against anyone who breaches the laws, regulations and policies governing the Programme by acts of misrepresentation. The Government also addressed allegations that an Authorised Agent received a letter supposed to be from the CIU authorising an application for Citizenship by Investment via the real estate option for US $150,000, a value below the Programmes requirements. The Government is investigating the matter and will take appropriate measures. The Unit thanked those who brought this information to its attention. It encourages anyone possessing any indication of wrong-doing in relation to the Programme to inform the Unit immediately. The Unit is committed to ensure this type of activity does not occur and is devoted to providing all Authorised Agents with a level playing field. The St. Kitts and Nevis CBI Programme is the world’s longest-serving and most prestigious programme offering citizenship in exchange for an investment in the country’s economy. All Programme investment routes are designed to bring further socio-economic prosperity to the Federation, to benefit all St. Kitts and Nevis citizens. “In addition to delivering quality and integrity in our programme, we will continue to innovate so that we retain our enviable position both as the originator of Citizenship by Investment and as the respected market leader in this field, Khan said. During his activities in Dubai and Abu Dhabi, Khan reiterated the Government’s position that they discourage agents from selling outside the regulations and there are no Government-sanctioned discounts on any of the product offerings. Khan noted that for the Sustainable Growth Fund, all monies are received into the Consolidated Fund based on the number of individuals on the application. International marketing agents receive a commission only after approval and funds are received. In discussing the procedures required to complete a real estate application, Khan emphasized these transactions are based on a sale of either US $200,000 or US $400,000. He said the application must be accompanied by a purchase and sale agreement. Citizenship is granted only after receipt of the relevant Government fees and a Memorandum of Transfer is provided. Alternatively, the face amount must be deposited into escrow. During Khan’s meetings attendees said they respected the Federation’s Programme and knew it had a high ranking. The UK’s Financial Times Special Report in its publication “Professional Wealth Management: A Guide to Global Citizenship the CBI Index 2018” reported that St. Kitts and Nevis’ Citizenship by Investment (CBI) Programme has been acknowledged as an industry leader in the world’s first comprehensive guide to countries that offer citizenship in exchange for investment: the CBI Index. The St. Kitts and Nevis Programme was compared with 11 other countries that offer CBI programmes and finished on top in four out of the seven components tested. These included due diligence; speed and ease of processing applications; and mandatory travel or residence requirements. St. Kitts and Nevis rated the highest in due diligence, owing to its strict parameters around vetting a potential applicant, which includes collaborating with international partners and non-governmental organisations to perform thorough on-the-ground and online checks of the applicant. “An integral part of my job is to uphold the Platinum Brand,” Khan explained. “My job is to ensure there is consistency in the way that our programme is marketed and managed by our agents and other service advisers. Looking to the future, Khan said the CBI Unit will continue to innovate and develop new programmes that are consistent with the Platinum Brand and which add value. He referred to the new, permanent citizenship option in the form of the Sustainable Growth Fund (SGF) is an example of this policy.